It has been far too long since I've posted here. Much has been happening; scattered swirls of things seeming unconnected. Now, it is time to create the bonds. Rehearsal reviews are filtering in slowly and I'm pleased with what I've heard and read. Three book signings have been encouraging. I need to set up more. Postcards are being sent to independent bookstores to announce the novel. The website is in place with new additions as time runs along. And, the second book of the series is at approximately the halfway point of its first major rewrite/edit. In between, I have done a fair amount of traveling and entertaining. We spent a week at gorgeous Table Lake in Branson, Missouri with our cabin overlooking the lake. I loved opening the curtain of the sliding glass doors in the morning and looking out at the Canadian Geese blanketing the grassy area between us and the shore. The two shows we saw and several other attractions were a lot of fun. The day on the pontoon boat where we took turns on the jet ski was priceless. I adore water and boats. One of my favorite times, however, was when I had the chance to sit out alone on the wooden bench swing facing the lake with nothing around me but nature. A perfect temperature highlighted the music of wind flowing through surrounding trees, accented by various bird calls. With notebook in hand, I had every intention of using that time to write. A poem was started, but left unfinished. Too thoroughly distracted by the view, I let go of the need to fill the time with work and allowed my soul to absorb the moment. It was a better plan, in the long run, since that moment is still with me, clear in my mind. I see it becoming part of a story eventually. I have also been reorganizing. The rush of the summer is over for the year, as well as the push of the new school year beginning, and now it's time to settle in and clear out the miscellaneous. Wednesday begins Nanowrimo (National Novel Writing Month). It is the quest to write 50,000 words of a new novel during the 31 days of November. This equals 1,667 words a day on the average, and is quite doable with enough discipline, although it's not an easy task, by any means. I've decided to make it even more of a challenge this year, since last year I hit 60,000 words during the month. I'm a literary novelist, mainly I write literary romance. For Nano, however, I've decided to try my hand at young adult fiction that would have interest for teen boys especially. There seems to be a limited genre selection for this age and that needs to expand. I'm guessing the story will become a blend of young adult/literary/action. It will be centered on music. As you can see from the photo above, music has taken a larger role in my life recently, also. 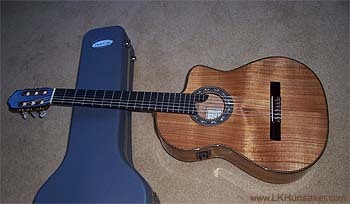 I am learning to play classical guitar, as I have wanted to do since I was a young adult. My characters have apparently inspired me in turn. For anyone interested in the writing challenge, go to http://www.nanowrimo.org and sign up. It's free and includes forums. It's also a wonderful learning experience even if this is the only creative writing you do during your lifetime. Give it a try. Winning isn't the important thing in this challenge. Trying, and what you learn while trying, is what matters. 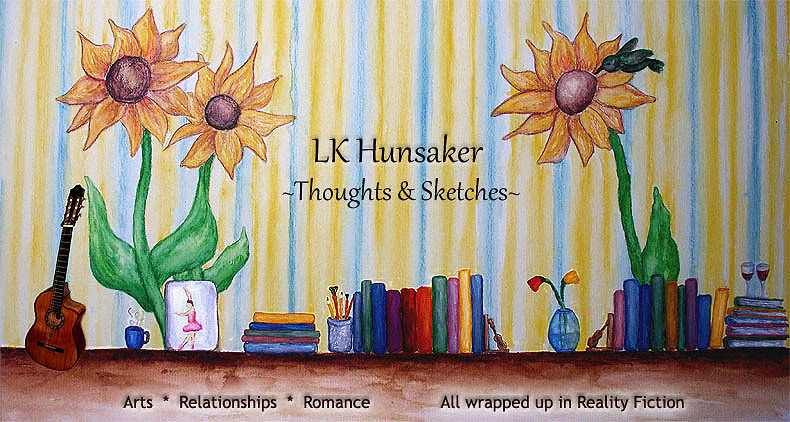 You can find me there by doing an author search for lkhunsaker. Most entries are open to everyone, although a few are restricted to registered authors or higher. I tend to ramble about everything under the sun in that one. This one will continue to focus on writing and the other arts.